I never have the same day twice. That's the nature of my job. And I love it that way. Yesterday stands out as more proof of that than most. It was, unofficially, 3D Printer Day in Licking County. Michael Cao, owner and inventor, IC3D, visited to rev up our STEM Advisory Committee for The Works, kick off the new 3D Printing Partnership, and show Newark Rotarians how 3D printers work. The members of our STEM committee at The Works are, in and of themselves, pretty impressive people who have stand-out success stories in the STEM arena. Michael Cao added a big plus telling his story and his company's goal of getting desktop 3D printers into the education arena in a bigger way. The future, in 3D, is solid here. School got called off for some kids and they wandered down to The Works only to find a presser underway to demonstrate one of the 3D printers that will be a permanent installation in the Invent Lab there. The Newark Advocate would later give it front page coverage and WNKO radio had a clip on the radio. The 3D demand is building for the future here. The Rotary logo printed out while 120+ Rotarians listened to Cao. 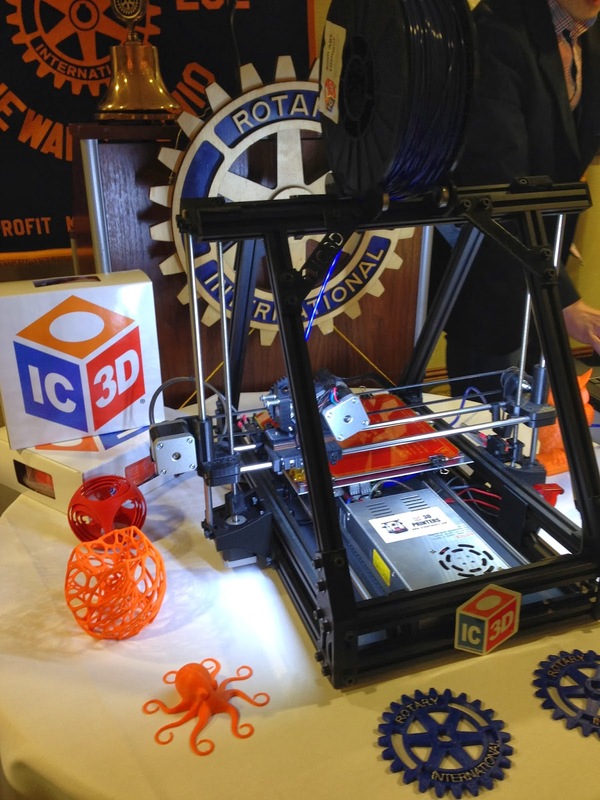 In the 98-year history of Newark Rotary, it's safe to say there's never been a 3D printer doing that. Future in 3D for sure here. No day like yesterday. That's for sure.